Following in the footsteps of the Pro-Test group in Oxford, UK, students and scientists at UCLA have pledged to stand up against the lies and misinformation of animal rights groups, and the violence of extremist organizations. They have formed the group Pro-Test for Science (formerly UCLA Pro-Test), which stands for science, reasoned discourse and the belief that life-saving medical research must continue without violence and harassment from misguided activists. 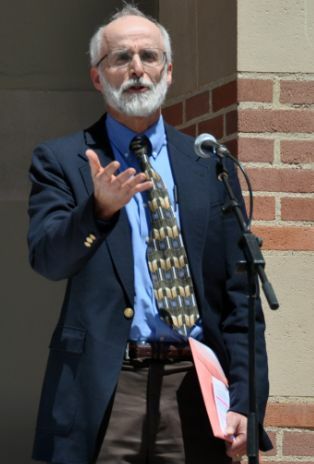 The group was founded by Professor J. David Jentsch, and he has been joined by a number of other scientists who have also been the victims of animal rights extremism in California. With the support of Americans for Medical Progress, Speaking of Research and Pro-Test (UK), we aim to challenge this climate of fear that has descended upon researchers in California and beyond! Speaking of Research encourage anyone in the Los Angeles area who is interested in helping educate the public on the important role of animals in research to contact Pro-Test for Science. 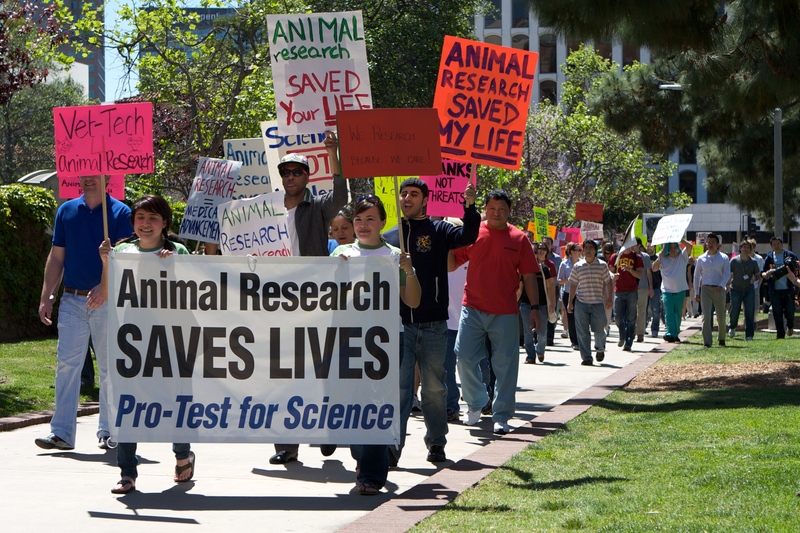 On a beautiful sunny day in Los Angeles, Pro-Test for Science organizers arrived at the junction of Le Conte and Westwood, on the edge of the UCLA campus, with armfuls of placards in support of animal research. Within ten minutes every placard had found a new owner as hundreds of scientists, students and members of the public showed up to support the cause. Those gathering chatted together, sharing their reasons for attending the rally. Those participating were not limited to the UCLA community. Faculty from University of Southern California, California Institute of Technology, and California State University – Los Angeles, all came out to demonstrate their support for lifesaving medical research using animals. Soon the chants began to ring out – “Penicillin? ANIMAL RESEARCH! Insulin? ANIMAL RESEARCH! Vaccines? ANIMAL RESEARCH! Anaesthetics? 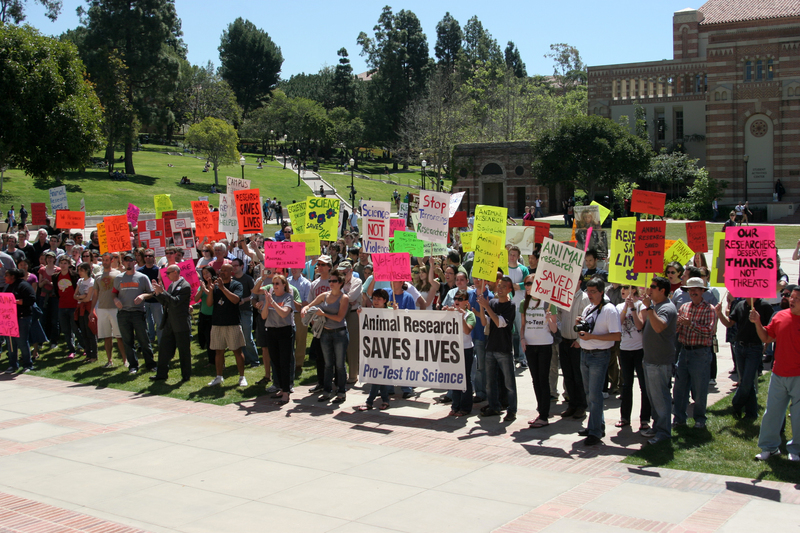 ANIMAL RESEARCH!” A short while later, when the crowd had swelled further, the rally set off towards the center of the UCLA campus. The mood was one of excitement and passion. Those participating exchanged ideas for public outreach in the future – sharing the best of ways of explaining to the public the clear connection between animal research and medical benefits. 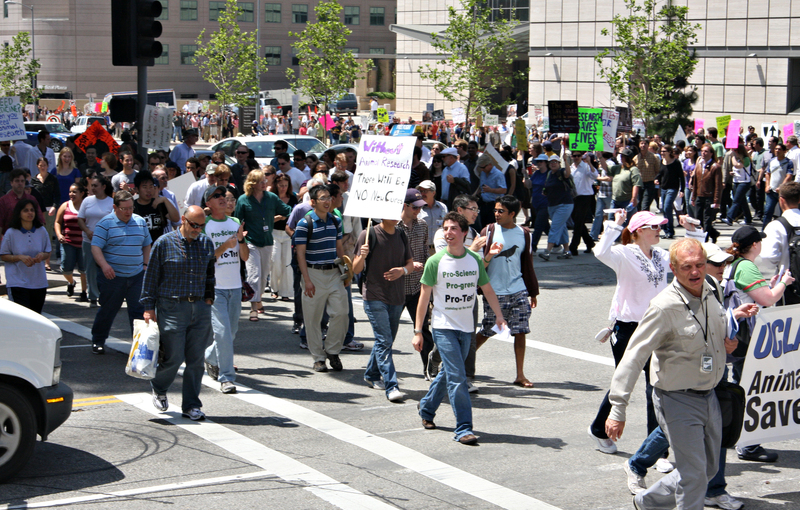 The rally continued to snake along Westwood and up towards Wilson Plaza. Eventually the tail end of the rally reached the destination (some time after the front end due to the length), and Tom Holder brought the crowd together for a picture perfect moment of solidarity before shouting “What do we need?”. “Animal Research” replied the hundreds of voices in unison. Holder then introduced the first speaker, Prof. David Jentsch – founder of Pro-Test for Science and member of the Speaking of Research committee – who took the microphone to rapturous applause. 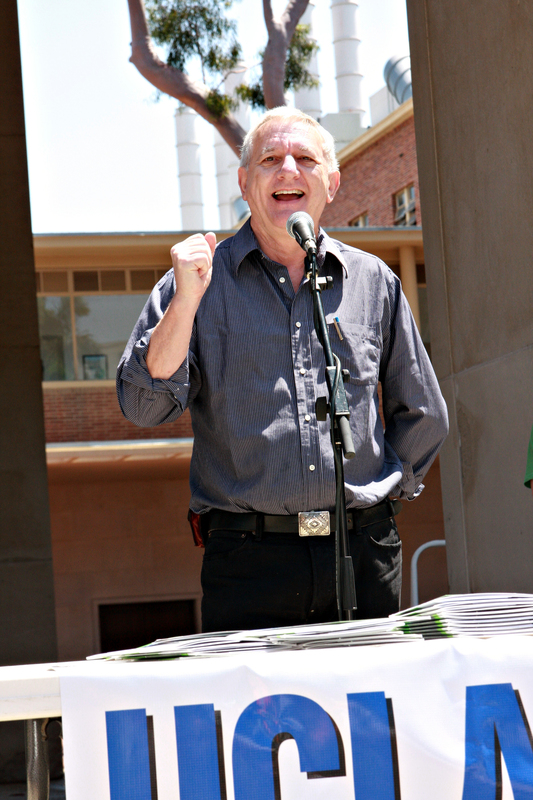 David spoke of the progress of Pro-Test for Science, and the struggle against animal rights extremists in UCLA. He took the time to thank each of the individuals who had made the 2010 rally possible eliciting a cheer from the crowd as each name was called. Jentsch then passed over to Tom Holder, founder of Speaking of Research. Holder thanked the crowd, insisting that UCLA were winning in their battle against extremists. However he warned the crowd against complacency – saying that public outreach was the only way to win this battle in the long run. 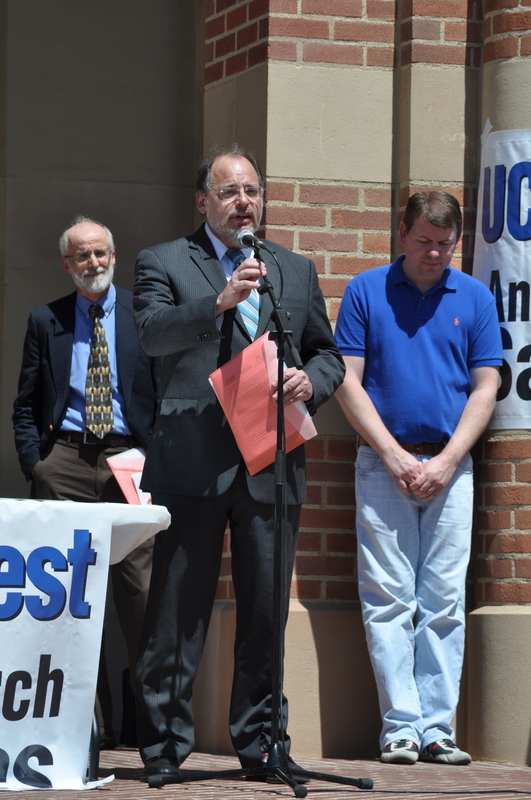 Holder also announced the success of the Pro-Test Petition, which had gained 11,621 signatures over the previous year (including Nobel Prize Laureates, and every chancellor in the UC system, including UC President Mark Yudof). He finished by announcing the presentation of the signatures to Dr. Kevin Quinn, Dr. Michael Steinmetz. Dr. Michael Steinmetz, program director of the National Eye Institute, talked of the medical breakthroughs in vision. He spoke particularly of Leber’s congenital amaurosis, a form of blindess which affects thousands of people across the United States. Through research in mice and then dogs (Briards), scientists found a way of inserting a gene into the eye through a virus, which could corect the problem. 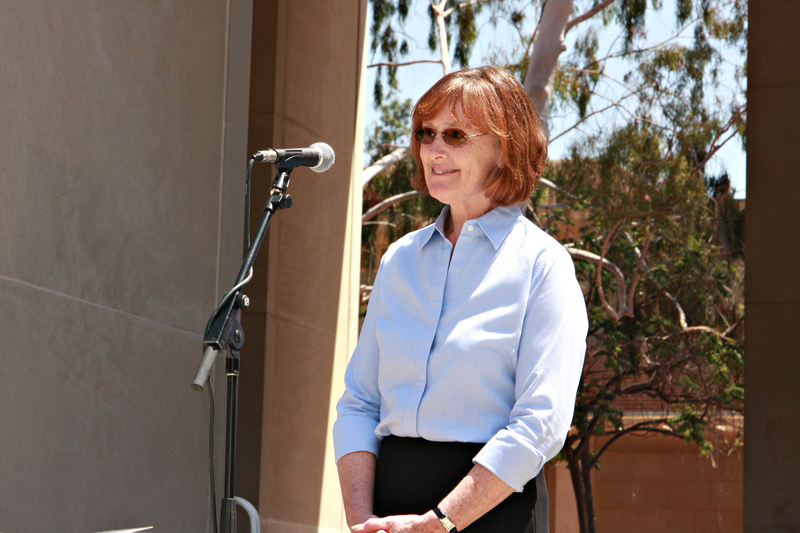 Jentsch then returned to the stage to introduce UC Executive Vice-Chancellor, Scott Waugh. 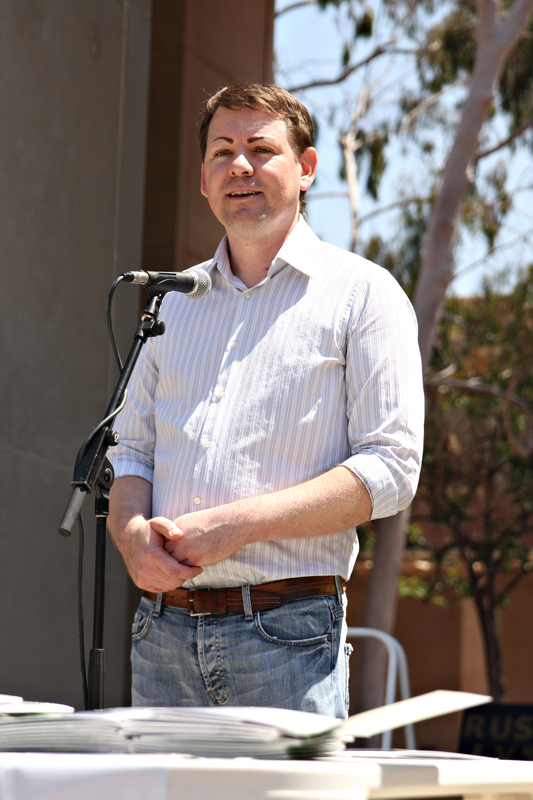 Waugh offered his continued support to researchers at UCLA, mentioning that the Pro-Test for Science movement has played an important role in bolstering support for research. He congratulated Jentsch and Ringach for organizing the February pabel debate, explaining that “violence, threats and other criminal activity are never a viable alternative to dialogue”. On March 7th 2009 Professor David Jentsch, a UCLA neuroscientist who works with vervet monkeys, was woken at 4am to find his car ablaze after an attack by the animal rights extremist group, the “Justice Department”. 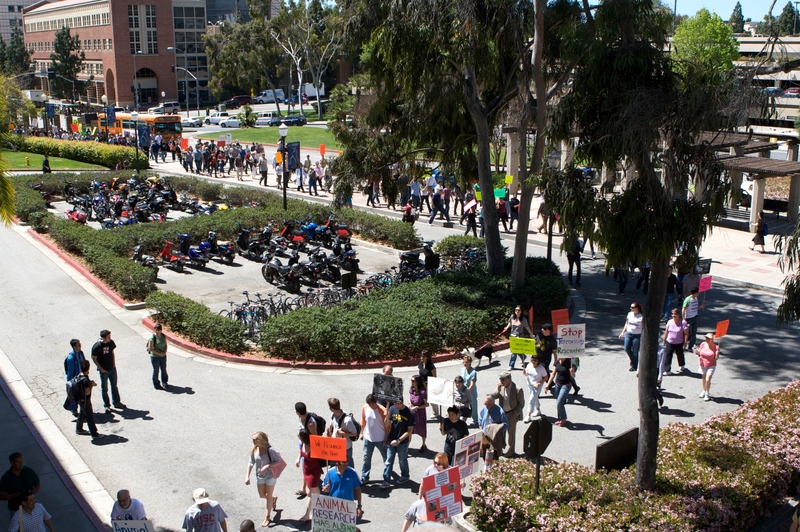 This was just one of a spate of attacks against researchers in the UC system. 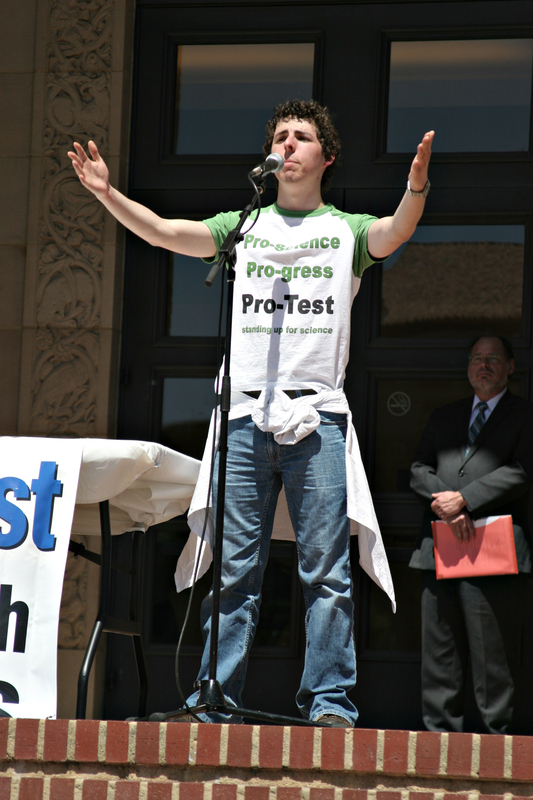 Rather than be cowed into silence he decided to make a stand – creating a small committee of researchers and UCLA students, as well as Speaking of Research founder Tom Holder (and a founding member of the UK Pro-Test group), to form a new group – UCLA Pro-Test – named after the UK organization Pro-Test which stood up to extremists in 2006. 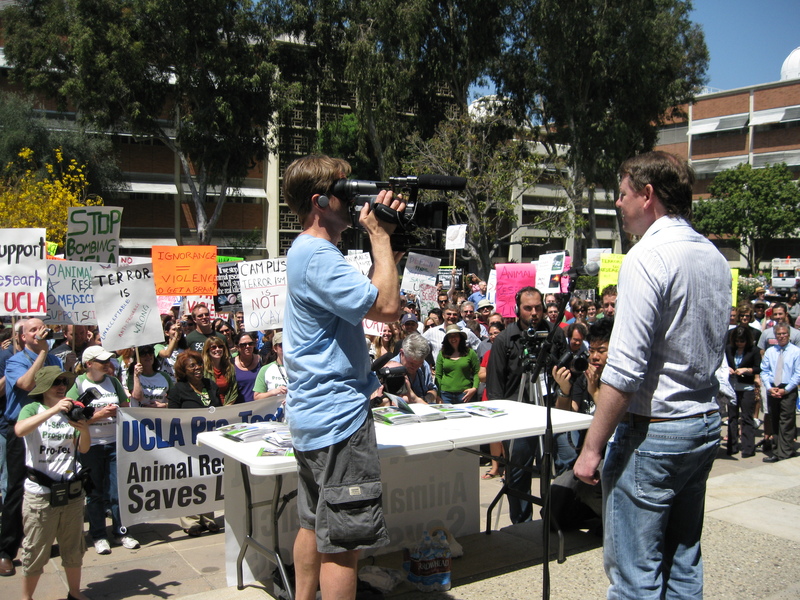 Jentsch and the committee decided to hold their rally at UCLA on Wednesday April 22nd 2009, the same day as an animal rights demonstration on campus. In just three weeks the committee planned and carried out the first mass pro-research demonstration in the US. On the wednesday morning the final arrangements were made, and the Pro-Testers prepared for the rally. 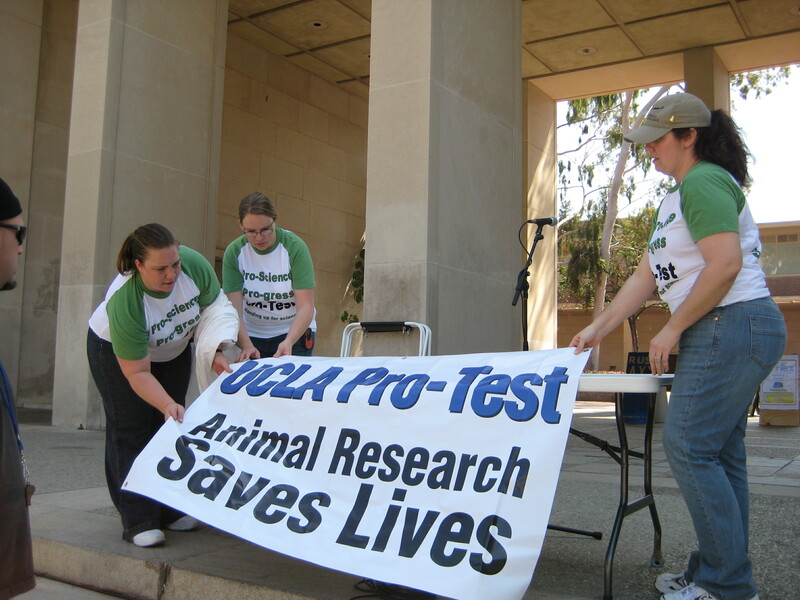 The animal rights activists, who gathered an hour earlier than the UCLA Pro-Testers, managed a whopping 40 people. And by just 11:10am, twenty minutes before the UCLA Pro-Test rally was due to start, the scientists and researchers were already outnumbering the animal rights activists across the street. Marchers gather on corner of Westwood Ave. The crowd numbers increased steadily. 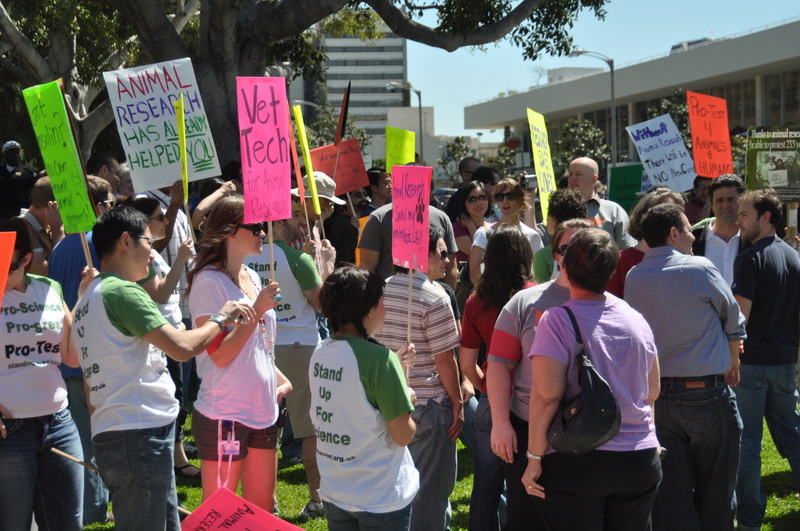 From 100 to 200, from 200 to 400, the numbers swelled until what would would be eventually around 800 people would be a part of the UCLA Pro-Test rally – outnumbering the animal rights activists by approximately 20 to 1. The chants rang out from the corner of Westwood Avenue, “What do we need? Animal Research. When do we need it? NOW!”, and “Cures for cancer, what’s the answer? Animal research, Animal Research”. 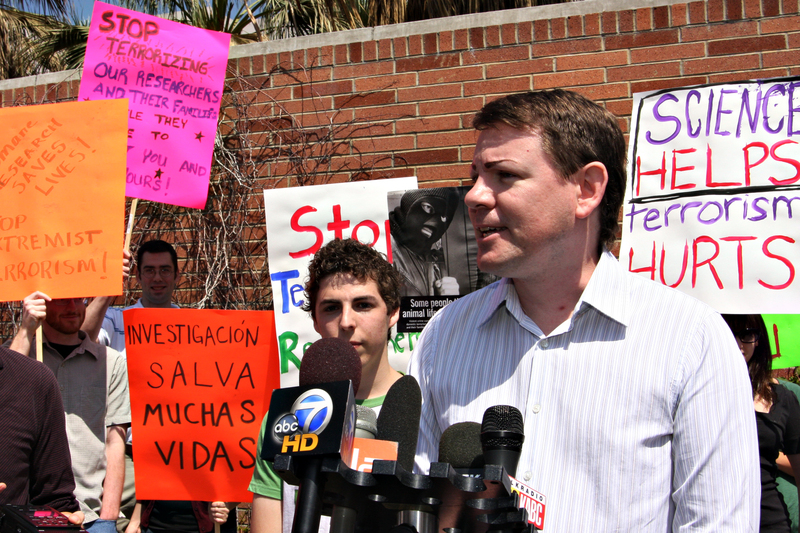 Shortly before the march began, David Jentsch and Tom Holder held a press conference (see video). 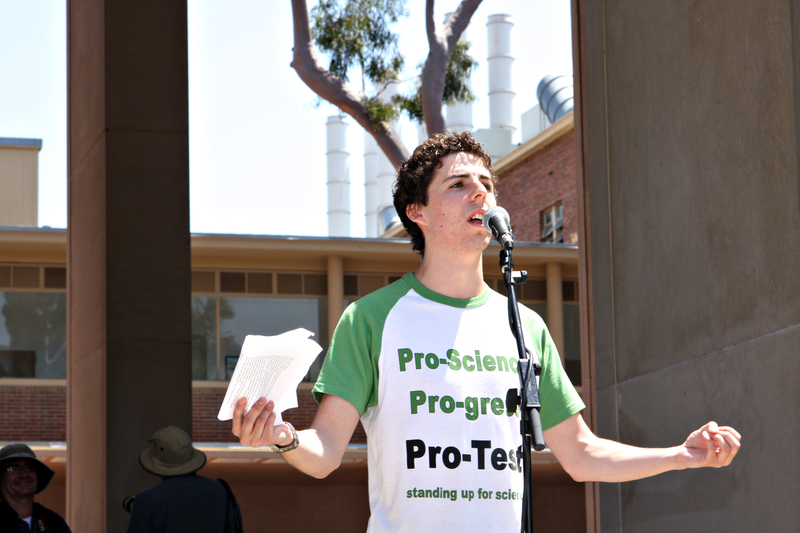 Minutes later, after a short speech from David to the gathered crowds, the Pro-Testers moved off towards the Court of Sciences at the heart of the UCLA campus. As the Pro-testers snaked across Westwood Avenue it became obvious that some of the crowd had not even left the starting location such was the size of the march. 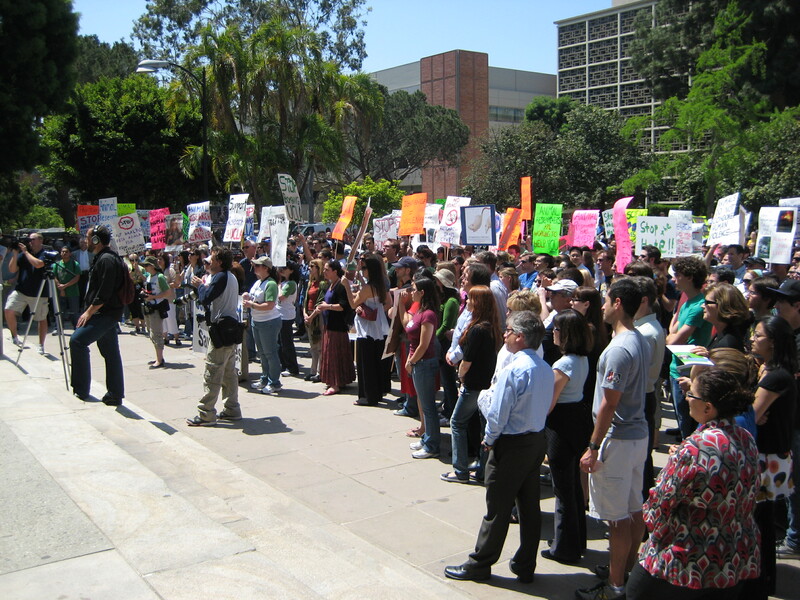 The crowd was a mix of scientists, veterinarians, animal care staff and students (both masters and undergrads) all there for the cause of standing up in defence of medical research and condemning the violent tactics that have plagued UCLA and its researchers. 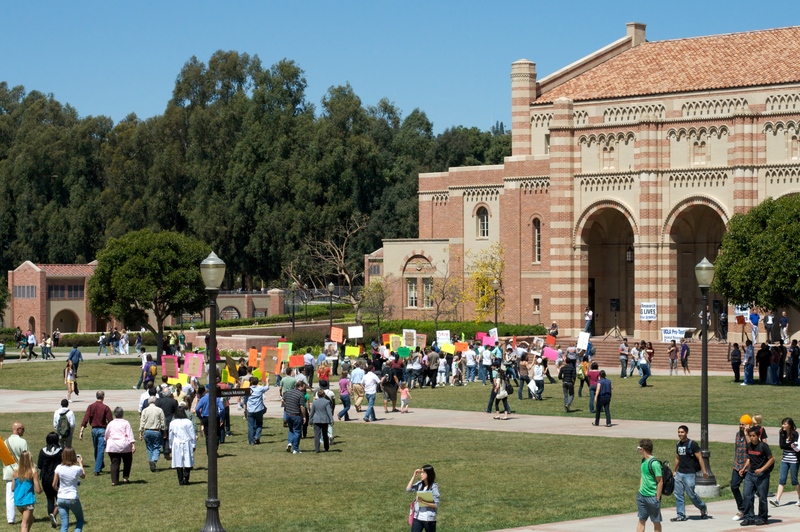 At around noon the rally arrived at the Court of Sciences on the UCLA campus, however it took almost another ten minutes for the back of the demonstration to finally reach the destination as a constant stream of Pro-Testers filed into the plaza. 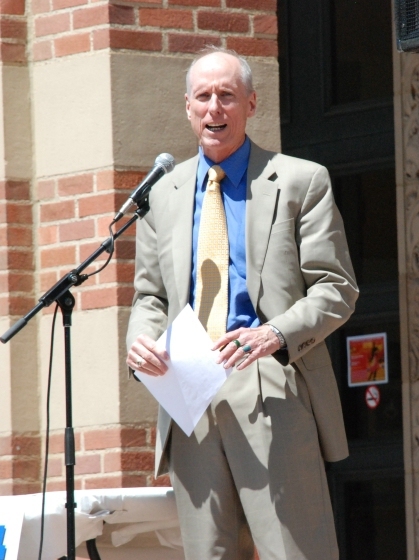 Tom Holder, acting as emcee, introduced David Jentsch – the UCLA Pro-Test founder. David spoke of the morning he awoke to find his car ablaze due to an act of animal rights extremism. He thanked the crowd for coming and reminded them “this is only the beginning”, asserting that more work was needed to change the public perception of animal research. 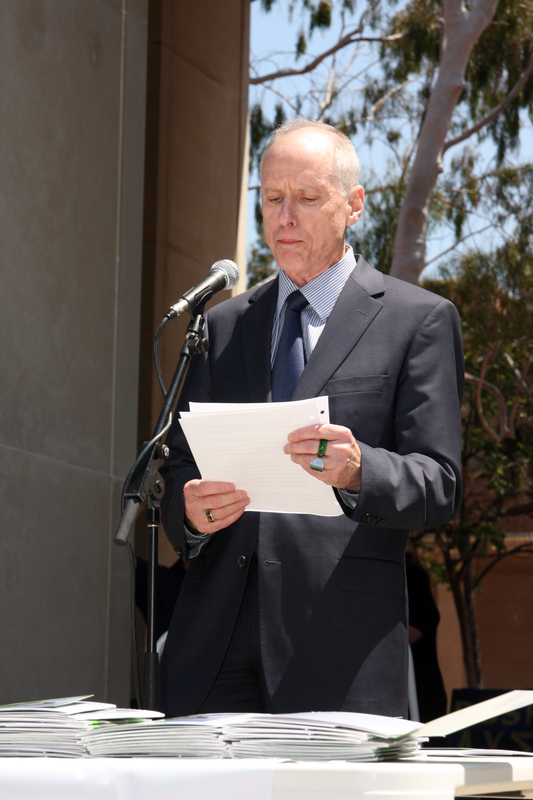 David then introduced the Executive Vice Chancellor and Provost at UCLA, Scott Waugh. In his speech he expounded the importance of animal research in past and future medical treatments. Waugh also reaffirmed UCLA’s commitment to supporting both the research and the researchers at UCLA from the terrorist tactics of the more extreme animal rights groups. Holder then introduced Professor Lynn Fairbanks, a UCLA scientist who spoke about her own son who has Type I Juvenile diabetes, and how she is thankful that animal research had contributed to the treatments which have saved his life. 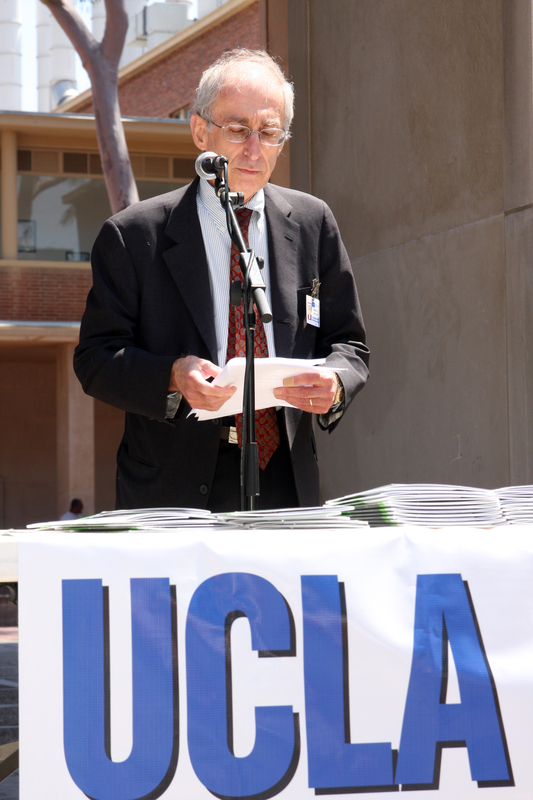 The next speaker was Professor Bill McBride, the chair of the UCLA animal research committee. He spoke of the regulations involved in animal research at UCLA that meant that animal welfare was of the highest standard. Furthermore UCLA researchers aim not just to meet regulations, but to exceed them wherever possible to improve the welfare of the lab animals. Emcee, Tom Holder, then spoke of the similarities between the UCLA Pro-Test and its namesake in Oxford in 2006. 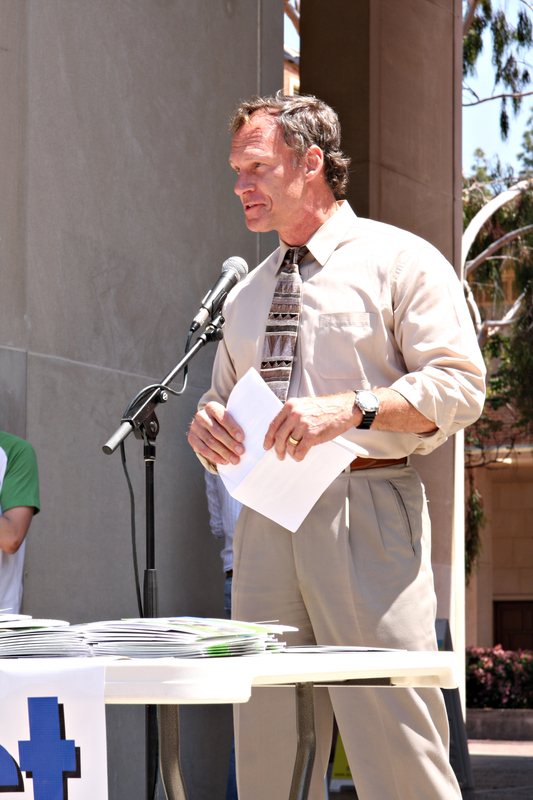 He also announced the launch of The Pro-Test Petition, a joint UCLA Pro-Test, Speaking of Research, AMP project to gather support of scientists and members of the public in California and beyond (sign today). Jentsch then introduced Dr. Gerald Levey, The Dean of the David Geffen School of Medicine at UCLA, who congratulated the marchers for standing up against animal rights terrorism. He also spoke further on the importance of standing firm at UCLA, talking about the potential loss for medicine if it were to stop. Holder introduced the final speaker, Professor John D. Young, chairman of Americans for Medical Progress and Director of the Department of Comparative Medicine at Cedars-Sinai Medical Center. A powerful speaker, Young spoke of the crucial importance that animal research has, comparing it to the use of animals as pets and for food. 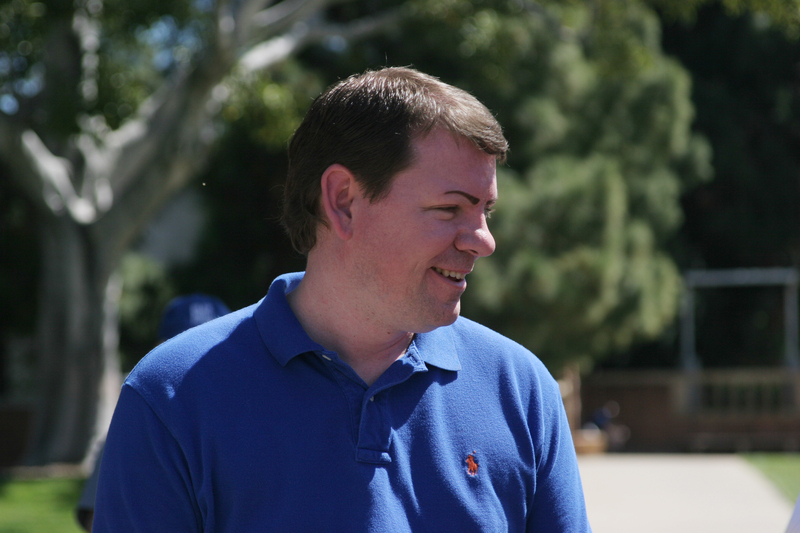 John Young had previously handled the media’s interest in his lab at Cedars-Sinai by inviting them straight in to look round – unsurprisingly the media were impressed with the high standards of animal welfare. Holder then returned to the stage to stress the importance of keeping the momentum of the movement going – as well as making sure everyone else knew about its value. “Now there’s some people who couldn’t make it to the rally, let’s make sure they here us now”, then stepping away from the microphone he shouted “No More Threats, No More Fear” – 800 voices responded – “Animal Research Wanted Here!” The chant lasted for around a minute, before Holder proceeded to thank the organizers, the speakers, the police, the crowd, and all importantly the man who started it all, Professor David Jentsch. David then appeared to thank everyone one last time to an almighty cheer from the Pro-Testers. Remember to join the UCLA Pro-Test Facebook Group.